Messier 16 (M16), also known as the Eagle Nebula, is located in the southern constellation of Serpens (the Snake). Using the infrared multi-mode ISAAC instrument on the 8.2-m VLT ANTU telescope, European astronomers were able to image the Eagle Nebula at near-infrared wavelength. The ISAAC near-infrared images cover a 9 x 9 arcminutes region, in three broad-band colours and with sufficient sensitivity to detect young stars of all masses and — most importantly — with an image sharpness as good as 0.35 arcseconds. The wide-field view of M16 shows that there is much happening in the region. The first impression one gets is of an enormous number of stars. Those which are blue in the infrared image are either members of the young NGC 6611 cluster — whose massive stars are concentrated in the upper right (north west) part of the field — or foreground stars which happen to lie along the line of sight towards M16. Most of the stars are fainter and more yellow. They are ordinary stars behind M16, along the line of sight through the galactic bulge, and are seen through the molecular clouds out of which NGC 6611 formed. Some very red stars are also seen: these are either very young and embedded in gas and dust clouds, or just brighter stars in the background shining through them. 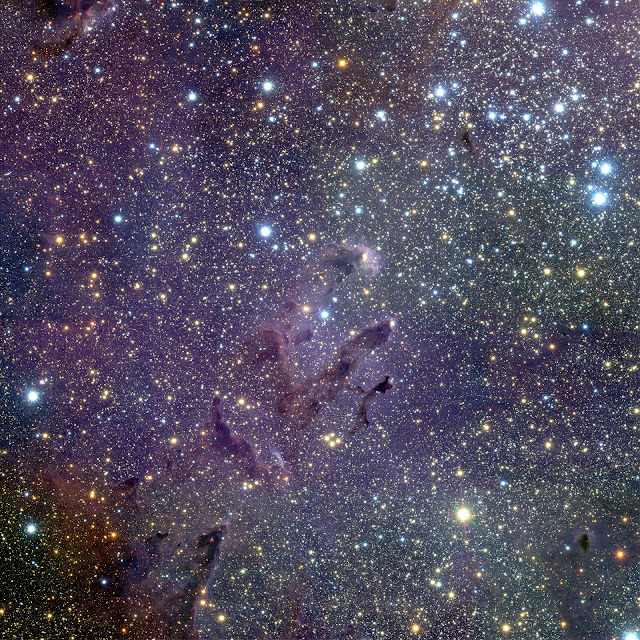 This photo is the result of a three-colour composite mosaic image of the Eagle Nebula (Messier 16), based on 144 individual images obtained with the infrared multi-mode instrument ISAAC on the ESO Very Large Telescope (VLT) at the Paranal Observatory. At the centre, the so-called "Pillars of Creation" can be seen. This wide-field infrared image shows not only the central three pillars but also several others in the same star-forming region, as well as a huge number of stars in front of, in, or behind the Eagle Nebula. The cluster of bright blue stars to the upper right is NGC 6611, home to the massive and hot stars that illuminate the pillars.